Armaan Rowther, Fulbright, Jordan: To What End? To what end? This was the question I would continually ask myself throughout the year that passed, from the day I submitted my Pre-Application at UC Irvine to the moment I was notified of my selection for the 2013-2014 Fulbright U.S. Student Program in Jordan. Looking back, I believe it was the most important question for both my application’s success as well as my eventual decision to accept the scholarship, transplant my life to the other side of the world, and dedicate one year to realizing the answer to that question. For some, sufficient enough as an answer is a single word, found in the very title of the relevant page on the Scholarship Opportunities Program website: prestigious. In a world defined by letter grades and accolades, the insidious idea that prestige defines the worth of any endeavor can ensnare university students. Through such a lens, the application process becomes a matter of self-aggrandizement and a game to be won. The deep reflection and thorough planning required of the research proposal is substituted with superficial strategies to sound appealing, and the introspection of the personal statement is replaced by self-laudation. It would be a lie to suggest that prestige did not factor into my thoughts about the Fulbright scholarship. Fortunately for me, however, there were too many other pressing matters in my life that year for prestige to seem as important: my grandmother was in bed rest awaiting surgery for congestive heart failure, I was juggling secondary applications to nearly three dozen medical schools, and at precisely the same time, I was trying to convince the woman who is now my wife that she should spend the rest of her life with me (and to explain to the man who is now my father-in-law how a medical student would support his daughter). Needless to say, it was a stressful period of my life. The question I thus had to answer to myself time and again was, to what end was I spending countless hours writing and revising draft after draft of my Fulbright application? For what purpose was I motivated to live abroad for one year and conduct public health research with refugees in Jordan? And most importantly, what would the experience mean both as part of who I am as well as what I hope to do with my life as a physician and scientist? In the end, the colors of family, identity, and purpose that were born of these questions painted every facet of my application. Asking “To what end?” of my research proposal even led me to change the nature of my project; what began as an observational study of barriers to care for diabetes patients became an interventional project incorporating public health education for diabetes prevention. I realized that the answer to my question was to benefit and empower the people touched by my project. Nothing more nor anything less. Lastly, asking “To what end?” enabled me to ultimately accept the Fulbright scholarship once I was selected. By the time I was notified, I was in the throes of planning my wedding and had an acceptance letter to my top-choice graduate program in hand. To accept the Fulbright meant deferring medical school for one year, shifting my home and life to another country, single-handedly running my research project abroad, and having to convince my wife once again, this time to move thousands of miles away with me only weeks after our wedding. Nonetheless, by reminding myself to what end I had applied, I readily accepted. As I write this post from my home in Amman, I could not be happier that I did. 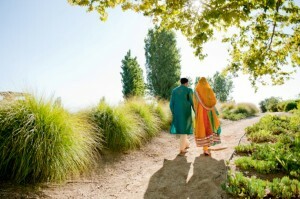 Armaan and his wife at their wedding. **The Scholarship Opportunities Program advises competitive undergraduate UC Irvine candidates in applying for prestigious merit scholarships. Our staff conducts outreach and manages the campus-level application and endorsement processes for these national and international scholarships, all funded by outside agencies. Applicants cannot apply directly to the funding agency (except NSF). This blog captures the experiences of our past scholarship winners, as they embark on journeys around the world funded by grants and fellowships such as the Fulbright, Strauss, Rhodes, and others. Read about their exciting adventures below! You are currently browsing the Scholarship Opportunities Program blog archives for November, 2013.